Michael Hogue, professor and associate dean of Samford University’s Center for Faith and Health, is seeking election as president of the American Pharmacists Association (APhA) for the 2019-20 term. Founded in 1852, APhA is the oldest and largest pharmacy organization in the United States. Hogue’s Samford story began as a student, earning his Bachelor of Science in pharmacy and Doctor of Pharmacy from Samford’s McWhorter School of Pharmacy in the mid-1990s. After graduation, he served in a variety of roles within pharmacy, including owner of a community pharmacy, co-owner of a home infusion company and ambulatory care clinical pharmacist, before joining McWhorter School of Pharmacy’s faculty in 2004. “We’re so proud of Dr. Hogue and his commitment to the profession of pharmacy, students here at Samford’s McWhorter School of Pharmacy and the American Pharmacists Association. 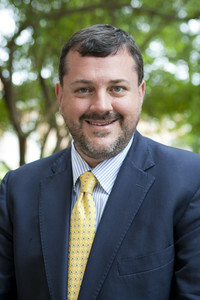 I can’t think of a more qualified person to serve this role, and I know he will provide excellent leadership,” said Michael Crouch, dean of McWhorter School of Pharmacy. In 2013, with the creation of Samford’s College of Health Sciences, Hogue was appointed as the associate dean for the Center for Faith and Health, which supports the engagement of missions and service learning opportunities for students and faculty within the college’s four schools: School of Health Professions, Ida Moffett School of Nursing, McWhorter School of Pharmacy and School of Public Health. Currently, Hogue serves as the Speaker of the APhA House of Delegates. He is also a fellow and distinguished practitioner of the National Academies of Practice. Members of APhA are encouraged to cast their vote electronically by going to pharmacist.com/apha-elections. Voting is open now, and it closes at noon on May 14, 2018.